A small stream that hosts chum salmon. Mark Pavesic fishing for chum. 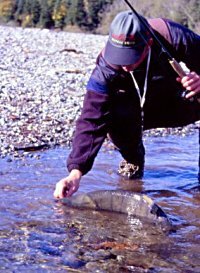 An angler battles a chum salmon. Mark Pavesic holds a chum salmon. 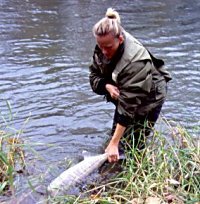 Jody Pavesic releases a chum salmon. A set of chum salmon teeth. Mark Pavesic battles a chum. The fall season had arrived slowly, but surly. It had been an untypical dry season on Vancouver Island, with little or no moisture fallen on this usually waterlogged region of Canada. To most of the suburban world, a slow transformation in the weather had left the people of Vancouver Island clinging on to the last threads of the long temperate days of summer. To myself, an agonizing wait till the mild misery of fall, and the first of the salmon runs return into my sunburnt life. Rumors of the fishery had been escalating with every rainfall. Coho by the thousands, evading the coastal rivers of Vancouver Island. The only way to put any truth to the story would be to dust off the gear, and head to the river of choice to sample some of these bullets of the pacific coast. With a well-placed phone call to a local fish fanatic, my season had a start time of 6:30 AM, not soon enough. Talking of seasons past, the fish fanatic Mark Pavesic and I, traveled forty-five minutes north to the emense fishery of the Cowichan, a system deep with salmon history. With the morning light casting shadows on to the weathered trail, we navigated our way to the lower reaches of the river; a slow piece of water known for giving up fresh coho on each rising tide. The first look at the river had sent a pleasant grin to appear on our faces. Salmon, and lots of them breached all around us and not a soul to be seen. Mark started working his way down towards the tail out of the pool while I presented my first cast of the morning at the middle of the run. My line had barely started its swing when a savage strike abruptly pulled my float into the cool depths of this over-size coastal creek. 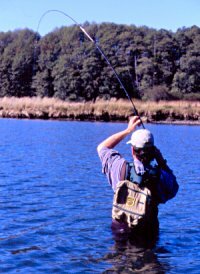 With a strong, upward lift, I placed the hook into fish and waited for the typical "coho roll" these fish were notorious for. To my surprise, numerous feet of my line disintegrated from my reel, leaving myself to wonder which of the salmon species had paid me a visit. With one spectacular leap my question was answered. A chum salmon around 14 pounds dancing across the surface like its chrome counterparts, but with a definite attitude to boot. A few more drag burning runs and the fish had settled enough to come to hand. The fish was surprisingly clean, showing very few signs of freshwater deterioration, and was still hosting numerous sea lice, proving how fresh this fish was. With evidence of these fish in the river, I knew my day would not be dull. Upon the release of this fish, a yell of "fish on!" had echoed it's way upstream. Mark himself was tied into a powerful chum taking the express route towards the tail-out only fifty yards below Mark's position. In true chum fashion, his fish made every attempt to shake his hook with huge leaps and monster runs, but eventually came to hand. From that cast on, it was rare our gear could travel more than twenty feet without it being savagely attacked by one of these brutes. Mark and I had been enjoying one of those days' anglers' dream of. With all the action, we were quick to forget what we came for, the coho. Settling for insedental catches of chrome, we proceeded to beef up our tackle and prepared to tie into more chum salmon than you could shake a fishing rod at. Over the years, the chum salmon been have seen as an undesirable on the West Coast. They have gained a reputation for being a purple and green toothy critter that has little or no taste and envade every ditch, creek and river from Alaska to California in the fall months. They were given the name of "dog salmon" due to the large teeth they develop during their spawning stage. With these misconceptions in place, the salmon have thrived while many other species have declined to record lows. The truth is that the chum are a tremendous fighting specimen, if not the best out of the five species and cromers can be encountered on a regular basis if timed right. As for tablefare, the chum is considered among the best for smoking due to their high oil content. The chum salmon (Oncorhynchus keta ) are the last of the five pacific salmon species to spawn and can live from three to five years on average. They primarily feed on plankton and crustaceans such as tiny shrimp and krill and can reach a mature weight of 35 pounds, but typically range from 8-18 pounds. The chum can easily be identified by horizontal purple bars on their side and a pronounced set of teeth. The males tend to developed a large kype and take on more of a football shape while the females tend to put on less color and are much more streamlined in appearance. The chum salmon for the most part utilize the lower reaches of a river to spawn and there young spend very little time in the system before entering brackish estuaries and the beginning of their migration. Techniques for the chum are as simple as it gets. Rods consists of a 9 to 10 1/2 foot medium action set-ups with a sturdy backbone to move these some-times stubborn fish and a levelwind open faced reel loaded with 150 yards of your favorite 12 to 15 pound mainline. From this point on, the cheaper the better. I have found over the year that the chum is rarely a selective fish and readily take almost anything as long as it is well presented. Inexpensive and widely available, wool in colors of green, red, and orange placed on a size 2 to 2/0 hook work just as good if not better than most tackle but at a fraction of the price. These fish can be successfully hit bottom bouncing or float-fishing depending on the river bottom structure but I personally choose the float system for detecting subtle strikes and the lack of hang-ups on the bottom. Floats, like anything come in various colors and sizes. I have grown on the 6" foam floats by Gibbs due to price and durability. Leader sizes vary from 18 to 40" depending on the water clarity of the day and I would recommend a minimum of 12 pound test due to the large teeth these fish carry at this stage in their life. For the weight, pencil lead and surgical tubing works perfect under most conditions. 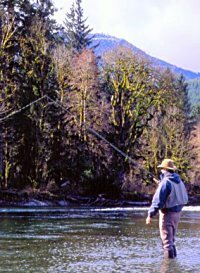 Locations for the chum salmon are found in the lower reaches of a river system and a general rule is the lower you can get, the fresher the fish will be. Slower runs with 2-10 feet of depths will hold good numbers of fish and chum will often hold tight to the banks and to any structure. Watch for jumping fish and cast in that area, because these fish are notorious for traveling in large schools therefor where there is one there could possibly be a hundred. Times for these fish a heavily dependent on weather and river flows. Often some of the best chum fishing I have experienced has been under exceptionally high water conditions. The chum salmon will mill around in river estuaries for weeks waiting for adequate water level before entering a system. 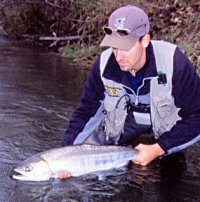 The first of the chum salmon with begin to enter the rivers in late September and continue into early December. I personally find late October throughout mid November to be the best depending on how much water is in the river. sounds like an ideal fisherman quarry. Than why have the chum salmon of the pacific gotten such a poor reputation? With numerous spot closures on chinook and coho salmon these days, anglers are searching long and hard for a substitute for their adrenaline fix. This is that fix. 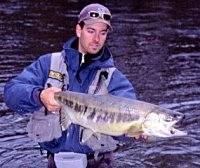 So beef up your gear, grab a friend and go walk a few "dogs"
Paul Deslauries with a chum salmon. In British Columbia, the Chum salmon are found in a majority of coastal rivers. 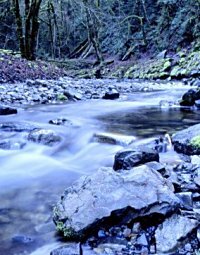 Systems prone to larger runs of the river tigers include the British Columbia's Cowichan, Harrison, Chehalis and Vedder rivers and Washington's rivers to name a few, with runs varying from a few hundred to over 500,000. For the most up-to-the-minute information, periodically check with your local tackle shop for the most productive runs in your area and also check you local regulations for recent closures. The world record chum salmon weighs in at an astonishing 35 pounds caught by Todd Johansson on July 11, 1995 in Edye pass, British Columbia.